Building consensus within America’s body politic and national security establishment for a new way forward with Muslims worldwide is a formidable challenge. Many Americans still don’t appreciate the complex nuances of Muslim society and remain stubbornly Islamophobic almost seven and half years after 9/11. Equally formidable is earning the goodwill of Muslims worldwide following the Iraq War as well as American atrocities perpetrated upon Islamic detainees at Guantanamo Bay and Abu Ghraib. Hopefully, President Obama’s historic election has finally opened a path for constructive conversation about how America can most effectively engage the Muslim world. 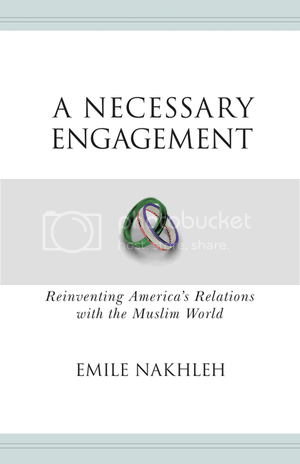 The CIA’s former point man on Islam, Emile Nakahleh, has vigorously entered this conversation with his new book, A Necessary Engagement: Reinventing America’s Relations With the Muslim World (Princeton University Press). From 1991 to 2006, Nakahleh served as the director of the Political Islam Strategic Analysis Program in the Directorate of Intelligence at the CIA. He holds a PhD in international relations and is a member of the Council on Foreign Relations. Nakhleh's proposals for improving American-Muslim relations stems from his conversations with Muslim "interlocutors" spanning three decades. These conversations include government ministers, Islamic activists, academics and radicals. Nakhleh also examined and analyzed considerable polling data of Muslims worldwide. Overall, Nakhleh contends that the vast majority of Muslims and America have common interests and values. His blueprint includes robust dialogue with mainstream Islamic political parties as well as a tangible commitment towards democracy in the Muslim world, even if we don’t always like the short-term electoral results. His book is an accessible 160 pages and divided into four chapters: (Chapter 1) Political Islam and Islamization, (Chapter 2) Intelligence, Political Islam, and Policymakers, (Chapter 3) Public Diplomacy: Issues and Attitudes and (Chapter 4) Public Diplomacy: A Blueprint. Nakhleh was born in Galilee, north of Nazareth in Palestine and raised a Greek Catholic. He emigrated from Israel to the United States approximately 50 years ago and attended a Benedictine university in Minnesota for his B.A., a Jesuit university in Washington, D.C., for an M.A. and was awarded a Ph.D. from the American University in Washington, D.C. Prior to joining the CIA he taught at a catholic college in Maryland for 26 years. Nakhleh agreed to a telephone interview with me in podcast format. Among the topics we discussed was whether he believes the surge in Iraq worked, the proxy war between Saudi Arabia and Iran inside Iraq, President Obama’s new strategy in Afghanistan, Hamas and America’s role in resolving the Israeli-Palestinian conflict and his argument that American commitment to democracy in the Muslim world is imperative to our long term interests. Some of Nakhleh’s answers and views may surprise many listeners. Our conversation was just over 47 minutes. Please refer to the flash media player below. Either searching for the “Intrepid Liberal Journal” or “Robert Ellman” can also access this interview at no cost via the Itunes Store. Please note I erred in the audio introduction when I said Emile Nakhleh worked for the CIA between 1991 and 1996. I meant to say he worked for the CIA between 1991 and 2006. Also, my apologies for the echo sound on Emile Nakhleh's side. Sometimes technology has its limits. Why was the first comment censored (removed)?